How much you earn from all of these depends on your participation and the offers you get. So, give them a try. Very legitimate and reliable survey panel. I love their surveys because even if you screen out, you get points. You can get some excellent products to test as well. You can make around $150/month and for the longer surveys, you get the products to test. Sign up for American Consumer Opinion here. The only research panel which may pay up to $50 per survey. You can do many things apart from taking surveys, like reading emails, watching videos but the surveys are worth your time. Sign up Free for Vindale Research. Survey Club is a unique survey company which offers paid surveys, research panels, clinical trails and much more. The surveys sometimes can go up to $75. You can get paid through PayPal or gift cards. Sign up here for Survey Club. This survey panel is very famous for the fact that you win prizes like vacations. From VIP Voice, you get rewarded with points by bidding on electronics and win vacations. If you like the playing and bidding game, then this is the survey for you. This is another favorite survey panel with a regular flow of surveys coming every day. I get about 3-4 surveys every day, and most of them are between $5-$10. The best part is you get the survey in your email so that you don’t have to visit the website all the time. Sign up for Valued Opinions here. This is a legitimate survey panel backed by Nielsen, and you should not be surprised if you earn $50 for some surveys. Sign up Harris Poll Online here. If you do most of the surveys sent by all these panels, you can make around $300-$400 per month. There are some things you should keep in mind to make surveys worth your time. Swagbucks is the most popular get-paid-to-do survey panel around. It is the most authentic and has paid $136 million to its users. You can search the internet, which is the most passive way to make money with Swagbucks. Other than that you can watch videos, play games, shop to earn extra cash. With the search option, I easily make around $50-$60 a month. Sign up for Free $5 Bonus Swagbucks here. Another awesome panel with many things to earn money. You can read emails, watch ads, play games, give your opinion and of course search the internet. You also get $5 bonus when you sign up. The key to making most with Inbox Dollars is, spread out your activities. Sign up for FREE InboxDollars here. An excellent way to make some money while do your search on the web. Just sign up for Bing and do your normal search. You accrue credits and redeem them for gift cards. You can earn around $200-$300 from all the above. Nielsen is an A+BBB rating company, so there is no doubt about the legitimacy. You have to download the app onto your PC or phone. It runs quietly in the background. You can enter into sweep stake entries and win anything between $25-$1000 every month. Sign up for Nielsen Digital Voice here. QMEE is a browser extension which will help to earn some extra cash whenever you do searches. The amount is not much, but it does add up. Whenever QMEE sidebar pops up during your searches, click on the ad and the cash gets added to your PayPal. It is only available in US and UK. With SocialSpark you can make money using your social media platforms. You have to register and add your Facebook, Twitter and other social media profiles on the website, and it will show how much you can quote to be paid. The brands will contact you whenever there are campaigns. You can make good money from this if your social media following is large. You can make anywhere from $1- $300 per campaign depending on your following. Another great app which pays to be active on social media. You register and earn RAB’s. You earn RAB’s by voting, providing content and ReDabs. It might take some time to get some good rewards. If you are going to be on social media all day, you might as well get paid for it. Ebates is the most famous cashback website which has over 1,700 online stores. Most of us do our entire shopping online, so why not get some cash back for your purchases? You can do all your shopping conveniently on your phone from the app. The best part, it’s all Free and you get $10 when you sign up. Sign up for Ebates here and receive $10 for a limited period. Another superb cashback website which is equally popular. Ibotta users have earned over $121 million in cash back. Like Ebates, Ibotta has a massive list of retailers. And for a limited time, Ibotta is giving $10 to new users to sign up. One more cash back website with 6,000,000 members around the world. It has a substantial presence in China, Japan, UK and India. What makes it different from others is, it also gives coupon codes. That’s double savings in your pocket. Similar app to Ibotta and a great cash back tool. You just have to upload the receipts after buying, and you get your specified cash back. Along with the app, Checkout 51 also has a web browser which makes it easier for users. You can start making money by selling photos on Foap. It is a marketplace for many amateurs and experts to sell their photos. In general, your photos can be sold for $10 minimum. You get a chance to sell your photos to big brands through ‘Missions’. They are campaigns where you can upload your photos, and if selected you can get paid anywhere from $100-$400. Go ahead and upload your photos just for fun sake, you might make some money. Download Foap here for IOS and Android. Another excellent app to market your photos. Clashot is a part of Depositphotos, and the prices for the photos range from $0.50-$80. You just have to upload your pictures, and whenever your shot gets sold, you get your commission. The more photos you upload, more chances of getting noticed. Download Clashot for IOS and Android here. Snapwire has challenges where buyers or brands post their projects and requirements. The photo shooters submit their photos, and if they get nominated by the purchaser, then direct selling starts. I have participated in some campaigns in Snapwire, and it can get you before many big brands. Download Snapwire here for IOS and Andriod. Start testing websites for Analysia and start making $10 per test. After registration on the website, you will get alerts about available tests. Usually, the tests take about 15-20 minutes. You don’t need any technical knowledge for this. This company has opportunities for international testers. You can get paid $8 per test. A test takes about 10-15 minutes. You will have to download a screen recorder to record your voice. Another good testing company to join is TrymyUI. You can register and start testing for $10 per test. Usually, a test takes about 20 minutes. Start testing now. Acorns is an app which invests your spare change. It invests the change from the daily purchases and builds a diversified portfolio. Once you reach minimum $5 in your account, the money gets invested in ETF’s. This is an excellent way to see your money grow in no time and not go through the pain of investing massive amounts. Sign up here to set up your Acorns account. 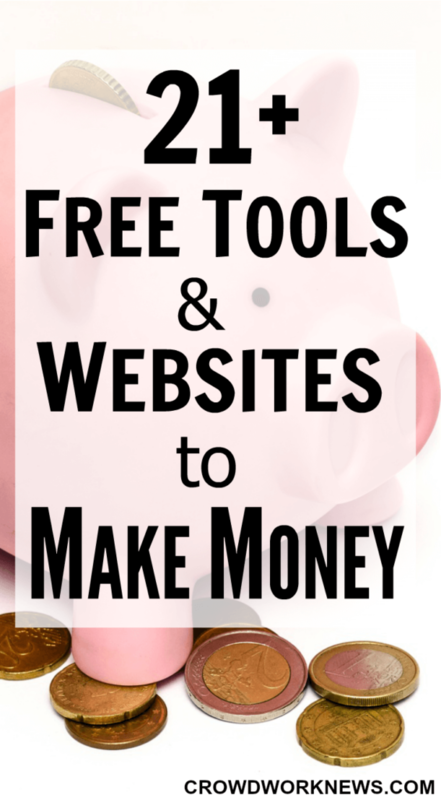 This is a huge list of some tools which can make and save money for you this holiday season. Go ahead and sign up for them to get your extra cash to spend on all the goodies. What are your ways of making extra money? Are there any more tools which can add some cash? Great list Sireesha! Thanks for sharing these. Thanks for the comment!! Glad you liked the post. Thanks for all your hard work! I love these posts.